Brightwood Park is a small neighborhood in  It is located in Ward 4, which is represented in the Council of the District of Columbia by Muriel Bowser. Brightwood Park is largely characterized by rowhouses, detached and semi-detached houses, and small neighborhood businesses. The neighborhood is often misidentified as being part of adjacent neighborhoods, such as the Brightwood neighborhood, the Petworth neighborhood to the south and the Manor Park neighborhood to the north. Hampshire Garden Apartment Buildings, listed on the National Register of Historic Places in Washington, D. C.
Nearby Neighborhoods in Washington, D.C.
Washington, D.C., African American, Neighborhoods in Washington, D.C., Kalorama, Washington, D.C., Shaw, Washington, D.C. 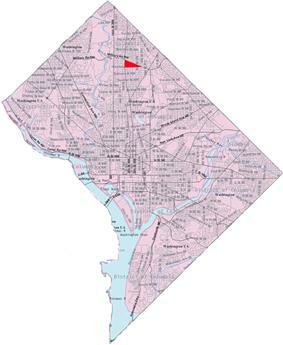 Neighborhoods in Washington, D.C., Anacostia River, Lincoln Heights, Washington, D.C., Kalorama, Washington, D.C., Shaw, Washington, D.C.
Washington, D.C., United States, Neighborhoods in Washington, D.C., Kalorama, Washington, D.C., Shaw, Washington, D.C.